Puzhehei National Tourist Resort is located in Qiubei County, Wenshan in Southeast Yunnan, 280 km from Kunming. It takes on Karst geological features and covers a total area of 165 square kilometers. It was noted for the world- rare and domestic- unique karst landscape and pastoral scenery since 1993. You can visit Puzhehei after Shangri-La tours. In the dialect of the Sani People who is a branch of the Yi ethnic minority, “Pu Zhe Hei” means a place abounding in fish and shrimps. 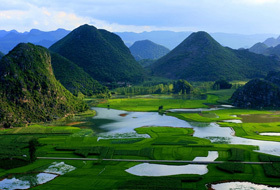 The scenic area gets known for hills, lakes, underground Karst caves and ethnic villages etc. 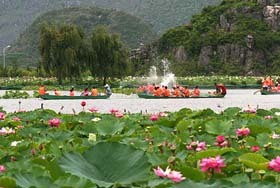 There are altogether 256 tourist sites, 312 isolate hills (peaks), 83 caves, 54 lakes and 40,000 acres of Karst wetlands. There are about 100 karst caves, most with two floors - a higher dry cave and a lower wet cave with an elevation of 1,450 meters. Puzhehei is deemed “the unique pastoral land with Karst landforms” and “beautiful paradise”. 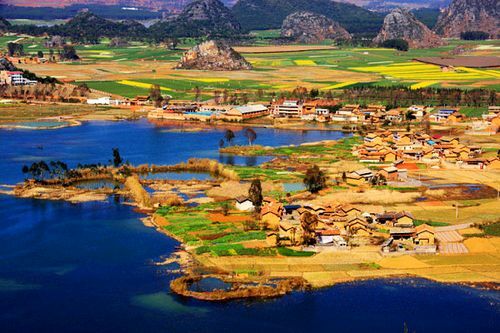 As one of the hottest tourist destinations in Southeast Yunnan, Puzhehei was approved as National AAAA-class tourist scenic spot in 2009. It has been named as the National Wetland Park in 2012. In the Puzhehei, the beautiful lakes and mountains composed a beautiful scenery for your eyes.There are 68 Karst Lakes and over 300 mountain peaks. It is also named "the Guilin in Yunnan” which means the most beautiful place in Yunnan always contained in popular China tour package. The limpid lakes, countless green hills, flourishing lotus flowers and small villages side by side attract hundreds of thousands of tourist every year. Ethnics living there are mainly Yi, Zhuang and Miao all of whom have developed colorful ethnic cultures of their own. The Sani people there claim themselves “Sanipo”. They believe they are the descendants of the Sani People in the Stone Forest who fled to Qiubei Area some 400 years ago. The entire village is made up of 75 families or 780 villagers, all of whom are Sani - a branch of the Yi Minority. As many other minorities do in Yunnan Province, the Sani People believe in animism which makes their traditional festivals mysteriously linked to gods and the nature. They deem themselves a nation that was gave birth by trees. That’s probably why a huge sacred tree is enshrined as the Dragon Tree on their yearly Mizhi Festival. Girls of the Zhuang ethnic group dressed in folk costumes which are adorned with jingling silver ornaments and embroidery, row little wooden boats and send visitors along the winding 21-km water corridor through Luoshuidong Lake, Puzhehei Lake and Xianren Lake. The Puzhehei Lake, meaning "fish and shrimp pool" in the Yi language, is 2.5 km long, 300 meters wide and about 3 meters deep. In the area there are 51 isolated peaks with the village houses of red tiles scattered on the sides. Living in the houses are 3,000 Yi people. Mount Dalong (dà lóng shān 大龙山), 109 meters above the water level, is located to the southwest of the lake, and eight karst caves link each other at the foot of it. A lotus pool with an area of 300 hectares, stretching 5 km, reflects forests on the hills, presenting scenery of exceptional charm. If you visit Yunnan, Puzhehei Lake should be option for your China travel.